Logitech Harmony 890 Universal Remote (and save 50%): a gift that will put you in control! Lets face it, there’s a downside to the consumer electronics revolution. A proliferation of black or silver boxes that live under the omnipresent TVs bring with them a multitude of separate remote controls; one to change the volume of the stereo, one to turn on the TV, one to control the DVD player, another for the TiVo; the list goes on. The Logitech Harmony 890 puts you in control of your entire audio-video system with just one button. It’s home entertainment the way it should be–simple. Optimized for complicated HDTV and PVR systems, the Logitech Harmony 890 helps you tame tough configurations like switching your television between video aspect ratios depending on the program source. The interactive color display lets you quickly choose a 16:9 ratio for movies and HDTV, or a standard 4:3 ratio for basic television programming. The new remote control models from Logitech’s Harmony line. Their newest consumer remote, the Logitech Harmony 890 , departs from the norm and adds a 128×160 pixel full color LCD display and docking cradle to recharge the included Lithium-ion battery. The entire remote has been completely remodeled by Logitech’s design team. This model is the culmination of the company’s influence and experience being put to the test in an effort to improve upon the past Harmony designs and ergonomics. Simply press an Activity button, such as “Watch TV” or “Listen to Music,” and your Harmony Remote automatically sets up each of the devices required for that activity. Sleek docking station that remote fully charged Programmable with Windows PC or Macintosh computer / USB Cable included 53 top-mounted hard buttons and 8 on-screen activity buttons 2 MB non-volatile flash memory. Yes, that’s right, the Logitech Harmony 890 comes with programming software for both Windows and Mac OS X! Now the Logitech Harmony 890 comes with 50% saving at US$ 199.99! 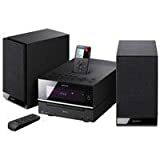 The Sony CMTBX50BTi Bluetooth Music Streaming Micro Hi-Fi Shelf System combines functionality and versatility, with abilities to play back iPod audio through the built-in iPod dock, and CD-R/W, CD-DA, and MP3 playback capabilities. It features a very stylish design that will enhance any decor, a built-in AM/FM tuner with 30 presets and automatic scan tuning, and two full range (2-way) speakers. This unique system offers great features that will be hard to match, such as front loading CD tray mechanism and braced construction to assist in superb audio tonality. Enjoy an external audio (mini jack) input, FL display technology, 25W per channel, and Bluetooth Stereo music streaming capabilities. Use it in your bedroom, kitchen, office or school. Either way, you will enjoy high quality audio reproduction at an affordable price. It’s the best companion to the Sony Bluetooth Wireless Transmitter for iPod and your iPod! It features the ability to stream music (wireless) from your Bluetooth stereo enabled PC, mobile phone or from a MP3 player with a Bluetooth adapter to other Bluetooth stereo enabled products such as headphones. This versatile player offers the ability to play your favorite music from your iPod with the built-in iPod dock. It offers a full-range of audio playback capabilities, including CDs, CD-R/RW, CD-DA, and MP3. Due to its full range (2-Way) speaker design, 5.9″ woofer cones, 1.6″ tweeters, and quality cabinetry, it’s capable of reproducing a full-range of frequencies and lifelike imaging. Its FL display technology not only gives you better resolution, but also lets data transition faster for smooth, clean graphics. Enjoy your favorite radio broadcasts with the built-in AM/FM wide-band tuner with 30 presets. The Sony CMTBX50BTi Music Streaming Micro Hi-Fi is priced at US $ 187! Get in (remote) control of your music with Gyration GYR4101CKUS Air Music Remote with Compact Keyboard with a twist - literally! With Gyration’s intelligent Gyration GYR4101CKUS Air Music Remote featuring MotionSense, the world just got a little bit easier to navigate.No strings, no wires, no tricks, no gimmicks! Just better technology allowing a more comfortable, portable mouse to operate in the air or on the desk: take control of your applications with a flick of the wrist! The Gyration GYR4101CKUS Air Music Remote combines the functionality of an In-Air Mouse with a Media Center PC remote and Universal IR control. It’s the perfect companion for home entertainment and PC convergence, offering complete access to your iTunes or Windows Media music from up to 100 ft (about 30 mt) away with RF technology and built-in LCD screen. 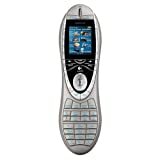 The remote is Microsoft Green Button certified and includes the one touch access to the Windows Media Center interface.The IR Universal remote allows you to control three A/V electronic components. The Gyration Air Music Remote with MotionSense, a gyroscopic subsystem containing sensory devices to sense motion, allows you to take control with natural in-air hand motions. It provides five degrees of freedom and 360° roll compensation to deliver any rolled orientation and produces true X-Y moon, dynamic drift compensation, and drift correction during motion. Use natural and comfortable wrist movements to take control of your iTunes or Windows Media Player content on your computer. The back lit LCD screen makes it easy to navigate through your entire music library. Grab the Gyration GYR4101CKUS now, at US $ 122.09 (46 % saving off regular price)! You are currently browsing the archives for the Music Remote category.